We have officially entered into Fall. Gone are the light ceviches and heirloom tomato salads that dotted menus across town. Chefs are busy revamping their offerings with autumnal flavors and slightly heavier dishes. We thought it would be fun to see how some of our favorite restaurants in and around Reston are incorporating Fall produce such as squash, mushrooms, and apples. Check out what we found! At Tavern64, Chef Nick Brennan introduces two new entrees to the menu. First is a half-chicken roasted in a honey mustard rub. It’s served alongside a mushroom bread pudding and roasted acorn squash. Second is a Chesapeake rockfish served over a butternut squash puree. Completing the dish are braised baby turnips and a pickled fennel salad. Both of these dishes feel like cozy, home-cooked meals… but better! The bar at Tavern64 is likewise inspired by fall flavors. 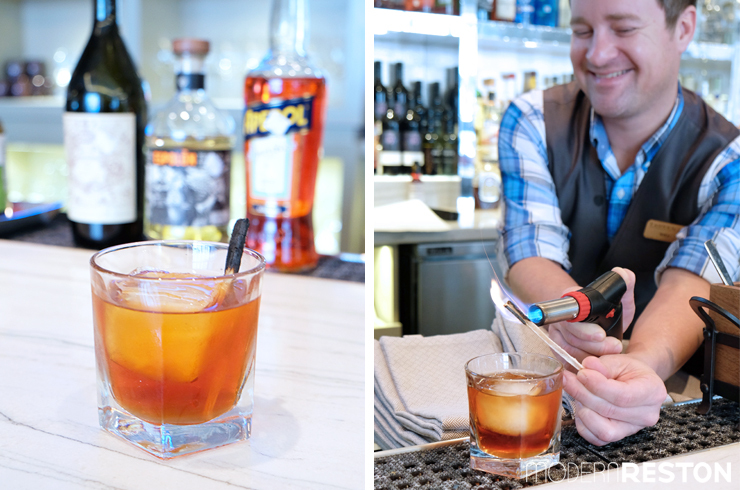 The newest addition to their craft cocktail menu is the Humo Antiguo, a concoction of Reposado tequilla, Carpano Antica, Aperol, and cardamon-clove syrup. Bartender Will Deber showed us how he smokes sugar cane as a garnish and explained how smoke was used for healing rituals in pre-columbian America. The spicy flavors plus the charred sugar cane create a warming experience for the senses. BarTaco already has an extensive taco list — oyster, two types of fish, duck, beef — but Executive Chef Ryan Morgan still finds room to be inventive as the seasons change. 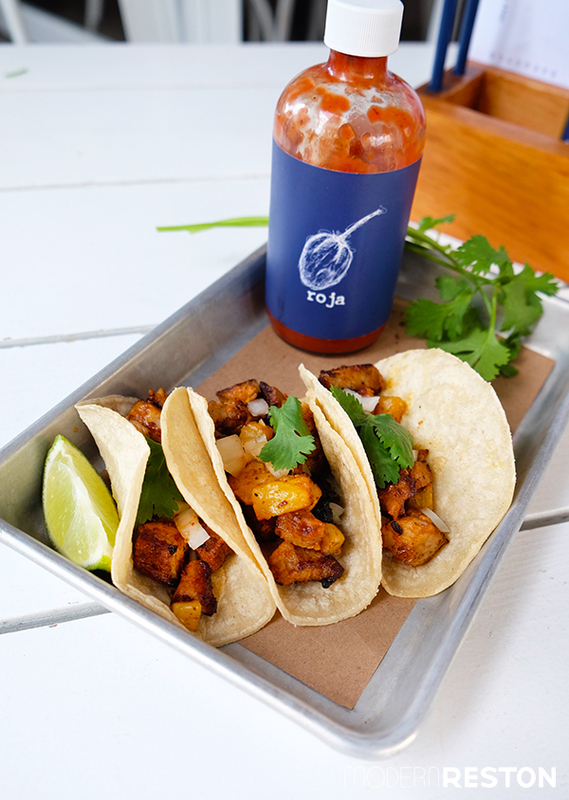 His newest addition, inspired by Mexican street food, is a slow-roasted rotisserie pork pastor taco. He first marinates the pork in chipotle, achiote paste, garlic, onion and pineapple juice. Then skewers it along with chunks of pineapple and cooks it over the fire. The tacos are finished with fresh onions and cilantro. They are extremely flavorful alone or with one of BarTaco’s many hot sauces or fresh guacamole. Anticipating cold weather ahead, BarTaco is also offering a light and flavorful chicken soup. 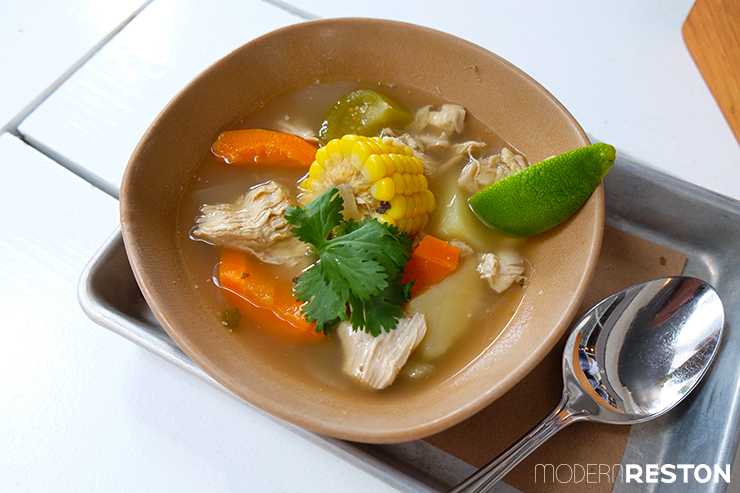 The broth is made with celery, onions, carrots, tomatillos, Mexican oregano, and finished with corn and cilantro. This is a great way to ease into winter stew season. Matchbox in the Mosaic District is taking full advantage of the beginning of bivalve season by adding a creamy wood-oven mussel dish to their menu. 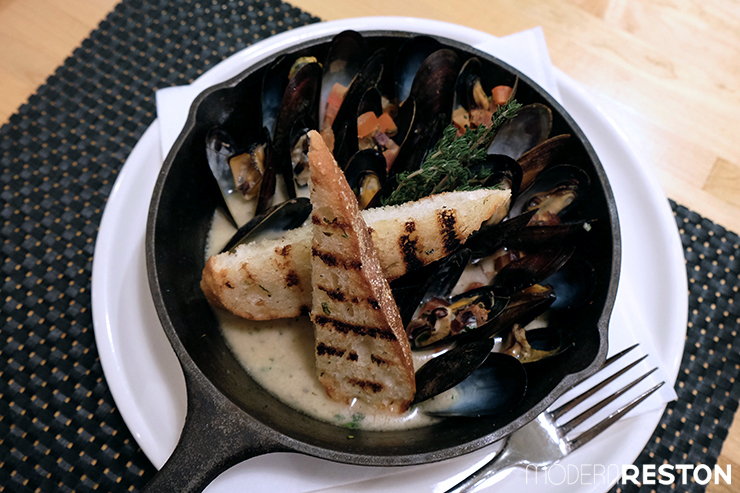 Tomatoes, bacon and gorgonzola are incorporated into a white wine herb broth that’s poured over the mussels. Garlic toast is perfect for sopping up the broth and takes this from an appetizer to a full meal. Chef John Michael Hamlet adds a quintessential fall side dish to the menu at Vinifera. 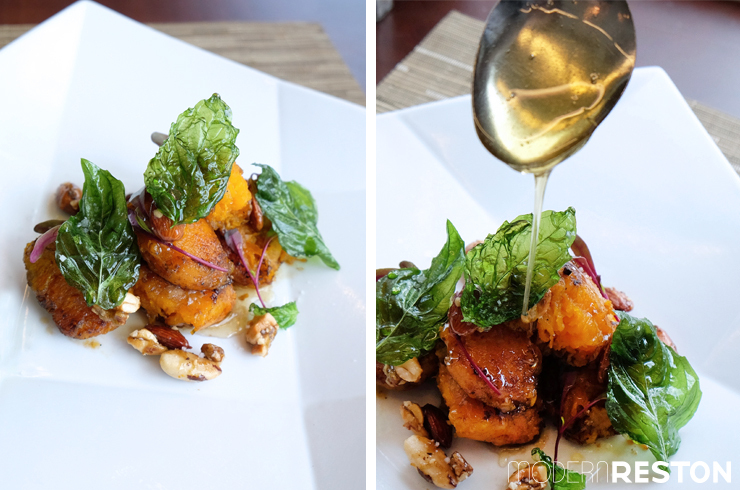 To accompany their hearty entrees, Chef sautés local butternut squash in brown butter, and garnishes with nuts and fried basil leaves. To take this to the next level, he drizzles warm local wildflower honey over the plate. It’s visually stunning and quite possibly the next addition to our Thanksgiving table! 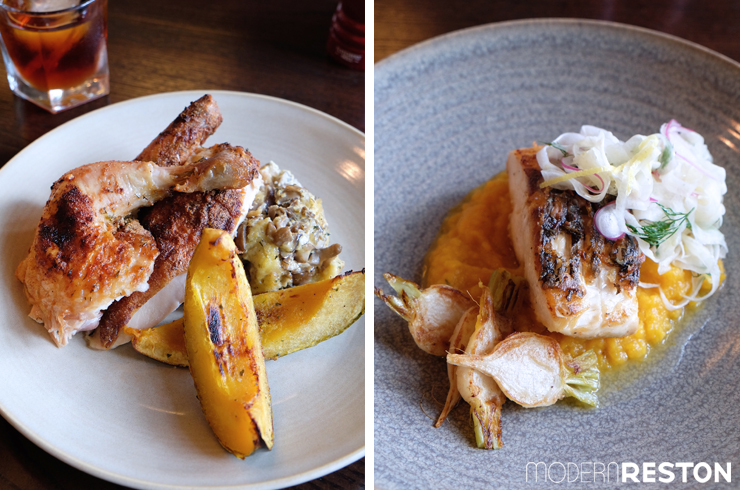 Chef Daniel Stevens of Mokomandy is continually experimenting with smoking fish in-house. In his latest iteration, he offers fish three ways served with a warm, fresh-baked rustic loaf of bread. 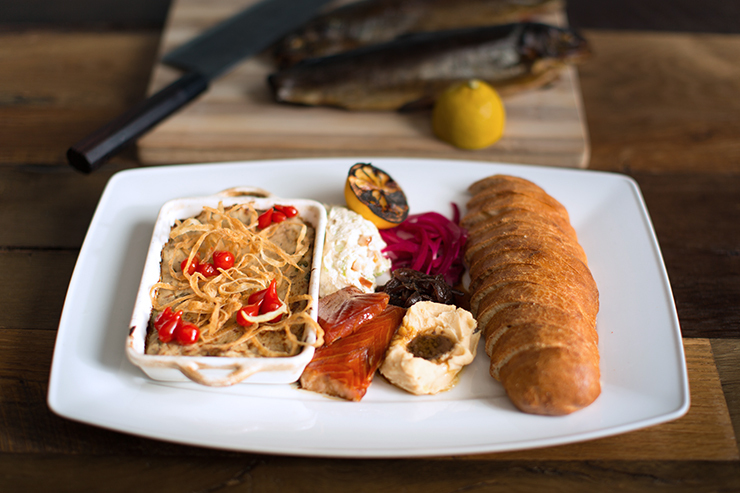 The hot-smoked bluefish dip is made with seafood spices, and topped with fried onions, and sweet pickled peppers. The second fish is a smoked trout and herb butter rillette. And the third is a hard smoked king salmon with a sweet baking spice glaze. Charred lemon, pickled red onions, carmelized sweet onions, and a white bean spread with a black garlic and black olive oil dressing finish off the plate. If you are looking to branch out from lox and capers, this plate is a playful foray into the world of smoked fish. Executive Chef Adam Stein and Chef de Cuisine Mike Santiago of Red’s Table are sensitive to guests’ special dietary restrictions. They regularly make sure to offer dishes that are vegetarian and/or vegan. One of their newest is the roasted acorn squash entree. 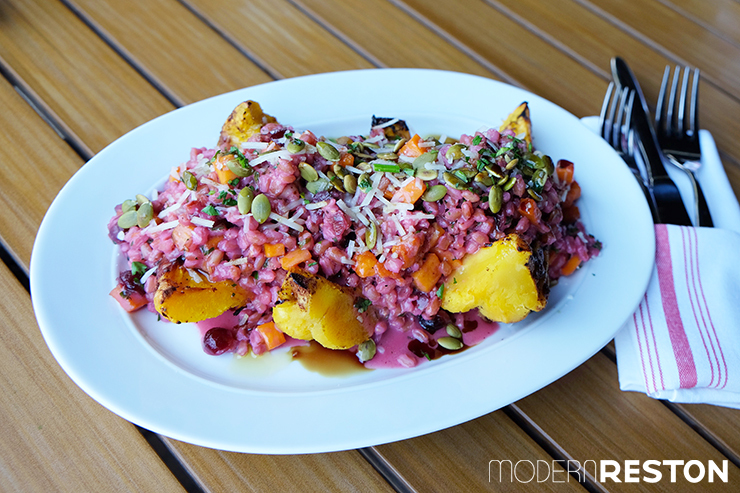 Squash is roasted in maple and brown sugar and topped with a farro risotto. The farro is prepared with beet puree, cranberries, pepitas, and Grana Padano cheese. It’s a hearty, full-flavored dish that will certainly satisfy even the most diehard meat-eater. This is just a small sampling from the fall menus that our local restaurants have recently rolled out. We’d love to see what you find while dining out. 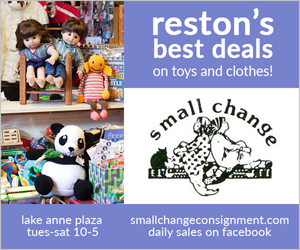 Please take pics and tag us on Instagram (@modernreston) as well as @vafoodie. VAFoodie is passionate about discovering the amazing food that Virginia is cooking up.